When I yearn to be cozy, both my Grandmother’s and Mother’s homes come to mind. 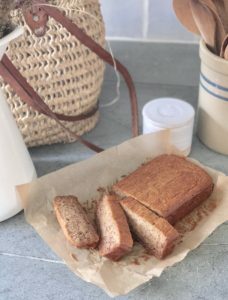 This banana bread recipe — ‘Grandma’s Banana Bread’ has been passed down from my Grandma Brenda’s kitchen, to my Mother’s, then and now to mine. 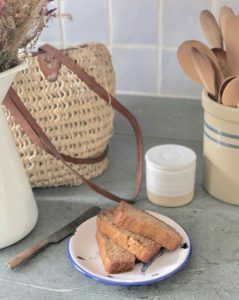 Today is one of those cool, rainy spring days made for a cozy cup of tea and warm banana bread. I have made this recipe countless times over the years, when making it this morning I just about had to rub my eyes for clarity. In disbelief, I reread the amount of sugar called for within the recipe — 1 1/2 cups?! I use overripe, almost black bananas when making this recipe. Therefore, the bananas alone are sweet enough to provide enough natural sugar for the entire loaf. I do not enjoy overly sweet treats, and even when omitting the sugar, the bread was still very sweet — sweet perfection! 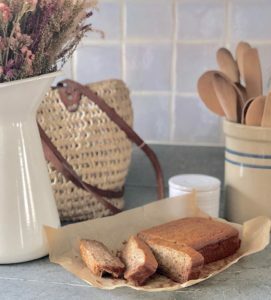 This banana bread is almost as cozy as a trip to Grandma’s. 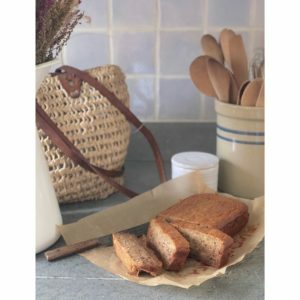 This old family recipe has been revamped to a healthier version of this traditional-style, moist, cake-like quick bread. And yes, you’re reading this recipe correctly... there isn’t any sugar! It truly doesn’t need it. The original family recipe calls for 1 1/2 cups of sugar, my goodness! Preheat oven to 350 degrees Fahrenheit. 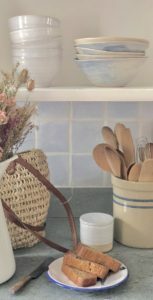 Prepare loaf pan or cake pan with parchment paper. Mash and measure bananas in a liquid measuring cup. Set aside. Meanwhile measure and whisk all dry ingredients. Then, gently stir in mashed bananas; add shortening, milk, and vanilla. Beat batter with a whisk for approximately two minutes until all ingredients are well incorporated. Pour batter into prepared pan and bake for 45 minutes, or until wooden pick comes out mostly clean. Serve immediately — it’s best when warm, as is or with butter and or whipped cream. Or let it cool completely and make it into a cake with your favorite icing. Cream cheese icing would best accompany. With any recipe today, prior to making it, I think about not only my own health, yet my daughter’s. Sugar can be found is so many unnecessary places — from plain yogurt, to sauces, to crackers! I revamp every recipe I use to eliminate as much sugar as possible. I also don’t use hydrogenated fats. I found a coconut shortening by Nutiva a few years back. It’s vegan and most importantly for our allergen restrictions, it’s peanut and tree nut free (note — the FDA considers coconut to be a tree nut. My allergist considers it to be a seed. If you are unsure whether or not you or your child is allergic to coconut, use an alternative shortening for this recipe). Additionally, the shortening is both organic and non-gmo. It does not taste like coconut, not even in the slightest. It looks and smells more like butter. It’s the perfect replacement in those old recipes that call for vegetable shortening.